This example illustrates zoned network diagrams. 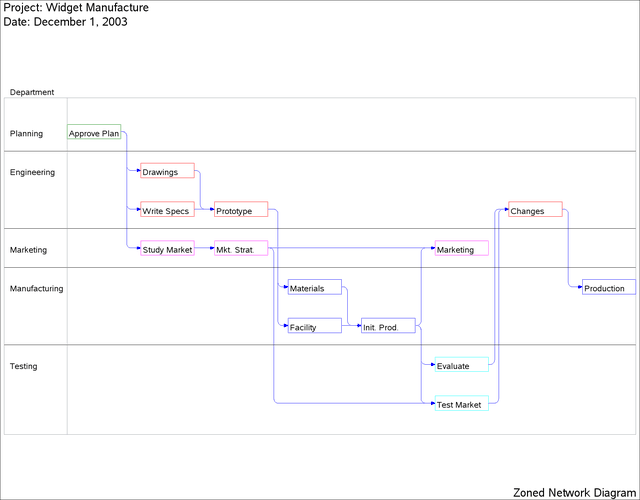 The Widget Manufacturing project is used to illustrate some aspects of this feature. The data set DETAILS contains a variable phase, which identifies the phase of each activity in the project. This data set is merged with the Activity data set from Example 9.1, WIDGET, to produce the data set NETWORK that is input to PROC NETDRAW. The ZONE= option divides the network diagram into horizontal zones based on the project phase. The ZONEPAT option causes the activities in each zone to be drawn using a different pattern. 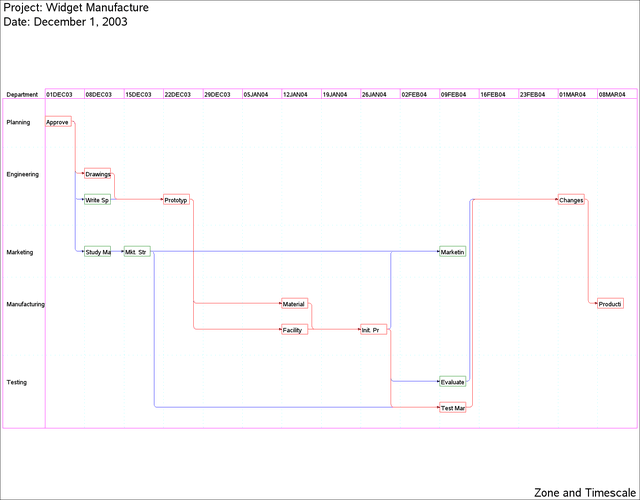 The resulting network diagram is shown in Output 9.11.1. Next, the project is scheduled with PROC CPM, and PROC NETDRAW is invoked with the ZONE= and TIMESCALE options. The nodes are placed in different zones as dictated by the ZONE variable, phase, and are aligned along the time axis as dictated by the default ALIGN variable, E_START. The MININTERVAL= option produces one tick mark per week for the duration of the project. The LREF= option identifies the linestyle of the reference lines and the dividing lines between zones. The nodes are colored red or green according to whether or not the corresponding activities are critical (PATTERN statements 1 and 2 from the previous invocation of PROC NETDRAW are still valid).